Hamster zorb balls and track rental. 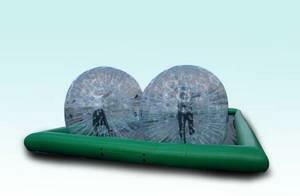 Hamster Zorb Balls – When you were a kid, did you ever look into your grade school hamster's cage and wonder what it was like for them to run at high speeds inside their little wheel without having to worry about a thing? Well, now you can suit up in a giant inflatable About to Bounce Hamster Zorb Ball and run a huge 70' x 35' track, without a care in the world. Perfect for any children's party or other energetic special event, the About to Bounce Hamster Zorb Balls and Track Rental is perfect for burning off that extra energy. The possibilities are endless. Imagine the excitement as you suit up one guest at one end of the 70 foot track, and another guest next to them suited and ready to race. Watch smiles appear on every onlooker’s face as your guests then run down to the other end. Struggling to make up and down the track. Priced at $575 for a two hour rental, and $175 per hour afterwards, the About to Bounce Hamster Zorb Balls and Track Rental gives you some incredible length and bounds of fun for the price.